Dr. Craig Waddell, Associate Professor in Michigan Tech’s Department of Humanities, will show excerpts for and lead a discussion of Long Night’s Journey into Day: South Africa’s Search for Truth & Reconciliation. 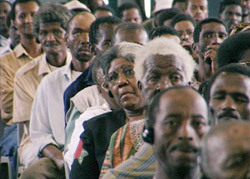 This 2000 documentary, directed by Frances Reed and Deborah Hoffmann, profiles four of the 7,112 cases that were considered by South Africa’s Truth and Reconciliation Commission (TRC). The film won the 2000 Sundance Film Festival Grand Jury Prize. Through the TRC, people who committed crimes during South Africa’s apartheid regime (1948-1990) were allowed to petition for amnesty. Amnesty could be granted if two conditions were proven: (1) the petitioner had a political motive for the offense (e.g., either maintaining or resisting the established order), and (2) the petitioner fully disclosed the truth about the offense (including, for example, the location of the remains of victims of political assassinations).